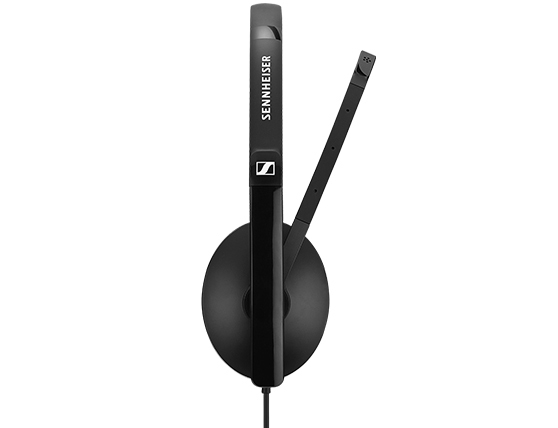 Sennheiser SC 135/165 - - SC 135 (single-sided) and SC 165 (double-sided) are headsets with 3.5 mm jack optimized for UC professionals, who value device flexibility, great sound, discreet modern style and comfort. SC 135 (single-sided) and SC 165 (double-sided) are headsets with 3.5 mm jack optimized for UC professionals, who value device flexibility, great sound, discreet modern style and comfort. The SC 100 headsets make a great impression. From their contemporary sleek styling to great sound for calls and multimedia, they excel in all areas: at your workstation, on the move around the office or on your commute to work, there is a variant tailored to your needs. With discreet boom arm design, adjustable fit and a choice between acoustic foam or soft leatherette ear pads, the SC 100 headsets are built for flexibility and comfort. Looks as good in the office as on the daily commute - with sleek contemporary design and bendable boom arm that folds discreetly into the headband. Sennheiser HD stereo sound (available on double-sided variants) - for calls or listening to music while working. Easy plug-n-play connectivity - with 3.5 mm jack. Easy transportation or storage - thanks to an innovative fold-flat ear cup design.